If you’ve already gone to the trouble of firing up the grill, there’s no reason to stop with the main course. Once everyone’s gotten their burgers or their chicken or their portobello mushroom caps, scrape the grate clean (or make a robot do it), stir up the coals, and start working on the dessert. There are so many things you can make beyond the basic s’mores or grilled peach halves, and most of them don’t take that much more work. To get you started, here are seven grilled dessert recipes that will impress your friends and make you feel like you’re really getting your money’s worth out of that Weber. This grown-up grilled dessert requires a little advanced preparation, but it’s worth it. Wedges of lightly sweetened polenta, perfumed with orange and spice, turn crispy on the outside and creamy on the inside when grilled. Pair them with juicy grilled plums and a light drizzle of balsamic and you’ve got a dessert that will make you look effortlessly sophisticated. Learn how to make it at Better Homes & Gardens. 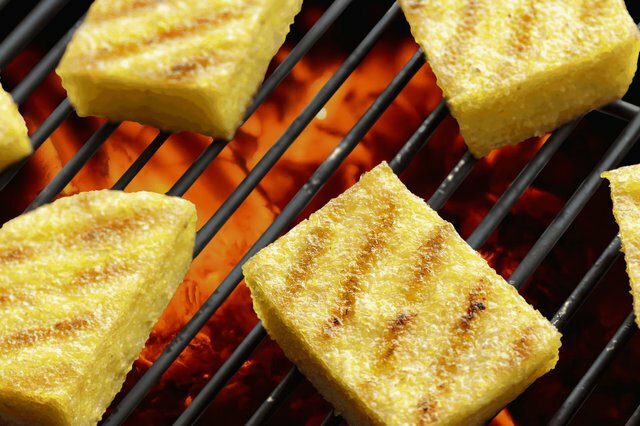 Serving grilled slices of pound cake with a little fruit and whipped cream is a classic cookout move, but this version takes it to the next level without too much extra work. All you need to do is whip up a sweet and spicy pineapple salsa laced with mint and jalapeño, add a glug of tequila to the whipped cream. And maybe to yourself. You've earned it. Epicurious has the full recipe here. 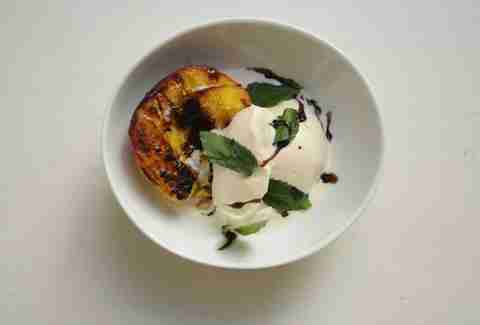 All it takes is a scoop of vanilla ice cream, a few sprigs of mint, and a drizzle of brown sugar and bourbon sauce (heavy on the bourbon, of course) to turn simple grilled peaches into a cool, cocktail-inspired sundae. Even better, this recipe makes extra sauce, so you can have julep-flavored everything for the next week. Roll over to Food52 for the full recipe. How do you improve on summer’s best campfire dessert? Stuff it inside cinnamon-flavored pizza dough and call it a calzone, of course. Then serve it with vanilla ice cream. This recipe includes instructions for making your own pizza dough, but no one will know the difference if you just mix a little cinnamon into the store-bought stuff. Get the gooey details over at Half Baked Harvest. 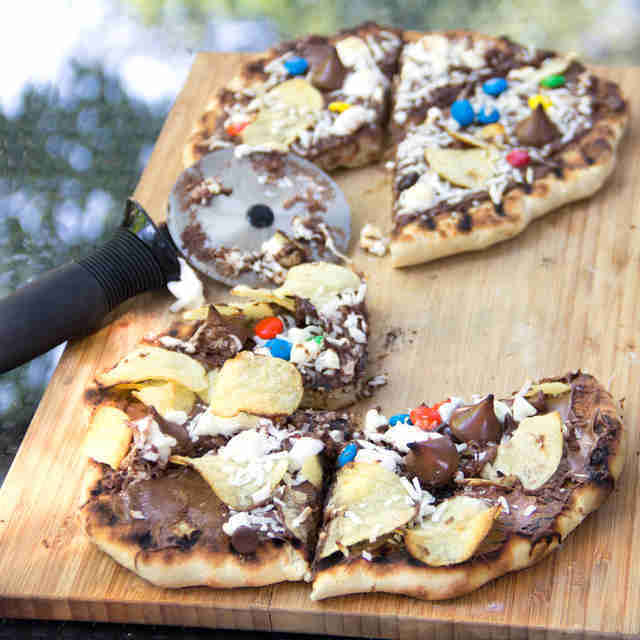 This is a fun dessert if you’re cooking for kids, but also who says you have to be a kid to love a pizza topped with Nutella and candy? Make this should be a DIY toppings situation, with a buffet spread of chocolate, marshmallows, pretzels, potato chips, crushed Oreos, etc., and guests young and old are guaranteed to go nuts. It's basically a grilled Take 5. Panning the Globe has your pizza party on lock here. Something magical happens when you throw donuts on the grill. Regular glazed donuts from Krispy Kreme or Dunkin’ Donuts or wherever turn tender and sticky and toasty and even better than they were before. They’re as hot and fresh as if they’d just come out of the fryer, but with a hint of toasted marshmallow flavor. Throw together a couple of sweet cream cheese dips -- one flavored with strawberries and basil, the other like a mint julep -- and suddenly you’ve got a fancy donut dessert. Get Better Homes & Gardens recipe here. Store-bought angel food cake is the cornerstone of semi-homemade dessert making. 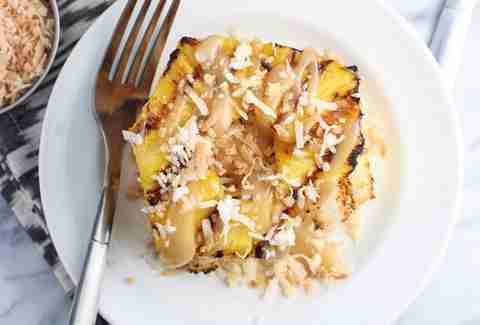 It’s meh on its own, but given a quick spin on the grill, plus toppings like grilled pineapple rings and coconut caramel sauce, it can become a delightful tropical treat, reminiscent of both piña coladas and pineapple upside-down cake. Also... why doesn't anyone make an upside-down cake cocktail? Get the whole recipe at My Sequined Life.